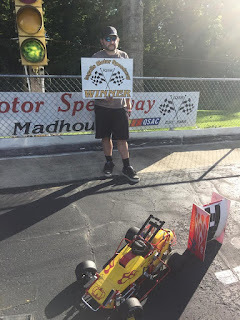 Indy Quarter Scale Racers: Herzog doubles up, Wheatley and Wachter also get their pictures taken in victory lane at the Mini Madhouse! Herzog doubles up, Wheatley and Wachter also get their pictures taken in victory lane at the Mini Madhouse! 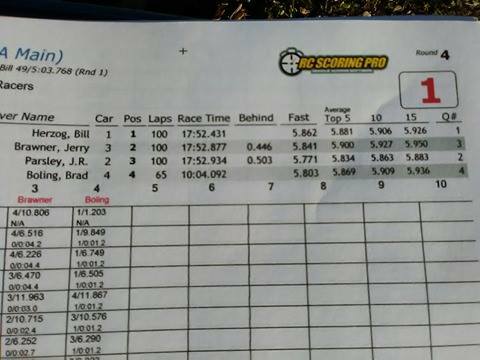 We had 20 cars in 4 divisions for Club Race #4 at Ingalls Motor Speedway for a beautiful day of racing yesterday. With The QSAC Nationals only a week away and other series racing that day it was still a great turnout for a club race at IQSR. Thank you to everybody that showed up to race with us yesterday. We had 4 Sprint Cars for some of the best racing we have seen this year at the Mini Madhouse. 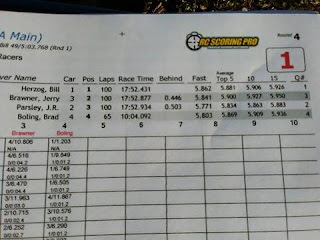 J.R. Parsley was your top qualifier with a 5.76 lap time followed by Bill Herzog with a 5.80, Brad Boling had a lap time of 5.82 and Jerry Brawner with a 5.87. With all 4 drivers so close, it made for some unbelievable open wheel racing action. Herzog was best in the heat races and started on the pole for the A Main. It didn't take long for the jockeying to start as all 4 had a chance to win. There was even a 3 wide battle for the lead midway thru the race as you could throw a blanket over the 4 cars. Boling was the first one out on lap 65 and had to settle for 4th. The other 3 battled the last 35 laps as Herzog was the most consistent and managed to take the victory. Brawner and Parsley crossed the finish line side by side for a photo finish. Brawner got the nod for 2nd place as Parsley settled for 3rd. We had 4 entries in this class yesterday and your favorite was Chris Stump as he was top qualifier. 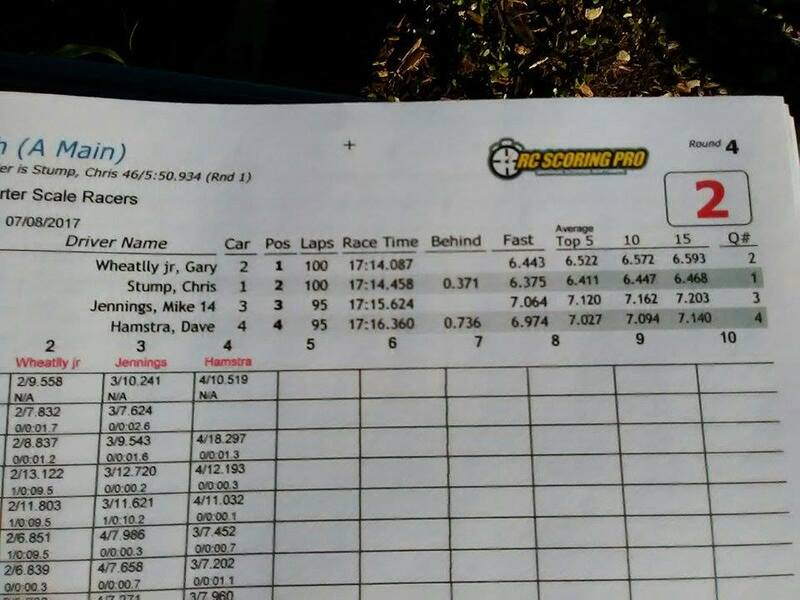 He was also your pole setter for the Main with Gary Wheatley Jr. starting 2nd, Mike Jennings started 3rd and Dave Hamstra started 4th. 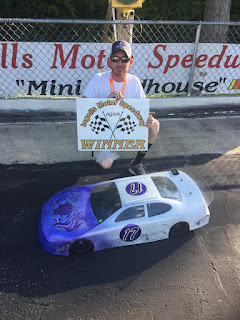 It was a 2 car race for the win between Wheatley and Stump. They switched positions several times during the 100 lap event. In the end, it was Wheatley taking the win and the heavily favored Stump had to settle for a 2nd place finish. Jennings took a 3rd place podium finish and Hamstra rounded out the 4. ECM was a tight battle of 3 cars, Tony Wachter was your TQ with a fast lap of 6.07. Followed closely by John Wachter and Ken Leiker. Tony started on the pole for the main and never looked back. 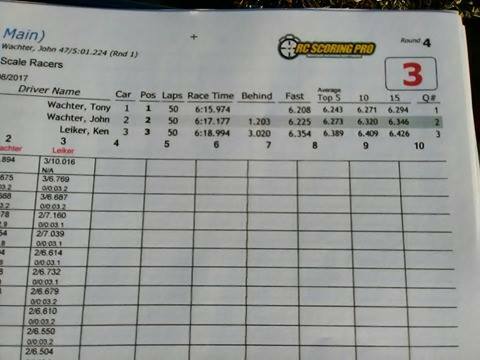 He led every lap of the A Main followed by John Wachter for 2nd and Leiker for 3rd. All 3 drivers did a remarkable job for a caution free race. There was a total of 9 cars battling for the Mini Madhouse victory in Sportsman. 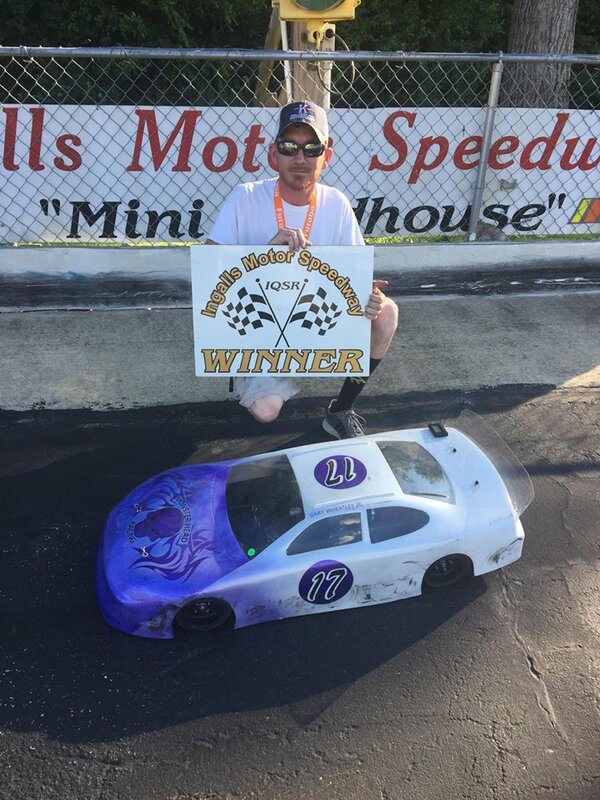 Dwight Smith was the TQ with a fast lap of 5.884, Bill Herzog qualified 2nd with a time of 5.899 and Scott Rance was 3rd with a time of 5.908. With the competition so close, any of the 9 drivers could take the win. Herzog was the best in the heat races to grab the all important starting position for the A Main. Herzog put on a clinic and never made one mistake to take the victory. 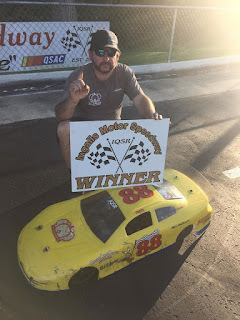 John Foster stayed up front almost all race to take a 2nd place finish. 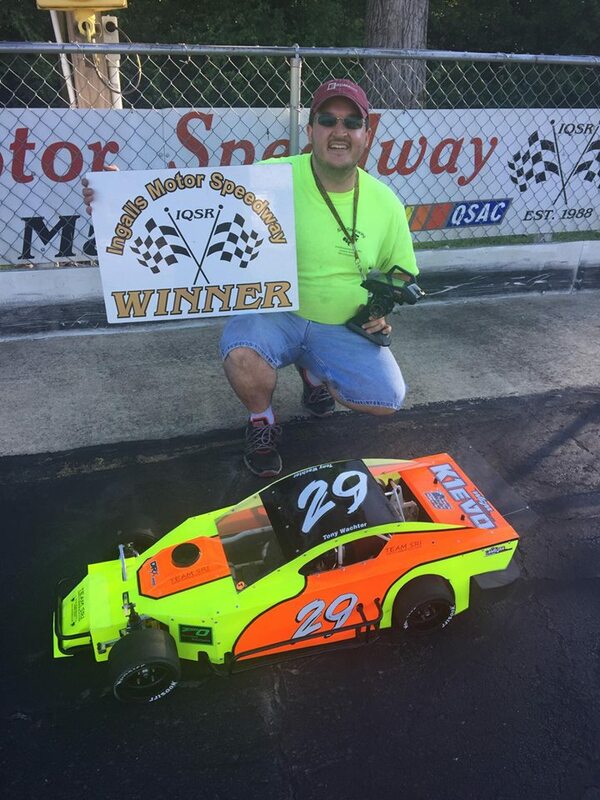 Tony Wachter rounded out the podium for 3rd place, Scott Rance had a great showing in his Sportsman debut for 4th. Dwight Smith was 5th, Jerry Brawner 6th, John Wacther 7th, John Foister 8th, and Steve Riddle DNS for 9th place. 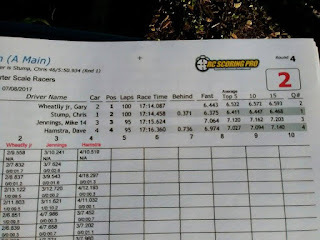 Due to the scoring loop break with 30 laps to go, I do not have accurate lap times available. I do know all 8 drivers that started, finished on the lead lap. Congrats to all our winners! 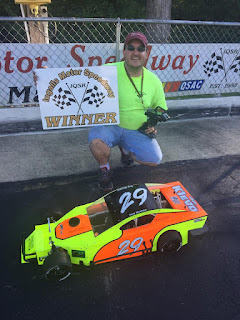 Our next race is July 29th and is a night race event. Feel free to come out and watch this exciting racing as admission is always free.